I finally bought myself an iPod Touch about a month ago. I wanted something to allow me to use electronic flashcards on the move. On the train I can use my DS and Kakitorikun but it’s impossible to use pen input properly on the bounce around tube journey. With the Touch I’ve more than doubled the amount of time I can study on the otherwise mostly unproductive daily commute, although I read a bit less as a consequence. I also find myself using it at other spare moments, a couple of minutes here and there going through flashcards.As a device it’s almost what I’d hoped for since my first Palm device by Sony. Lot’s of storage, lot’s of good apps, a good screen, small and light it easily goes in a shirt pocket, good battery life, a good reasonable price as long as you don’t need the phone or 3G functionality. The oversights. No pen input. For kanji learning and quick notes and just drawing a pen is indispensable. A finger just isn’t good enough; it’s like a blunt jumbo crayon compared to a 0.1 Rotring pen. That said the multi-touch interface is nice, except for all the erroneous button pushes and link clicks. And you can forget about ever using a stylus on the current screen. If they are all like the one I bought it’s not much of an improvement over a finger. What I dream of now is for an iPod DS. two screens in a clamshell. One multi touch the other pen input. With a user replaceable battery while I’m dreaming. I don’t care about lack of Flash. This seems to be the new version of the OS wars. That the OS is locked down by Apple is of more concern. At least I’d like to see more interoperability between apps beyond cut and paste. I’ve been using an ad blocker for so long on my MacBook that it’s a bit ugly seeing all those ads on the web again, and there sure ain’t going to be any blockers for browsers on the iPhone OS. The core of the experience is the Apps. Odd given that the iPod is touted as an MP3 player and the iPhone as a phone but really they are the Newton finally realised albeit without handwriting recognition. Anyhow what’s on my Touch? My first stop was to get flashcards going. I was very disappointed at the functionality of iFlash Touch (free, but really only an extension of the desktop app). It’s very basic compared to the desktop application. About the only good thing I can say is the sync between the desktop and the iPod is easy. It’s a shame because I like iFlash but I think the developer is too busy with his life and studies to keep up with the runaway iPhone market. I looked at Mental Case, which has a Mac desktop client, but I didn’t want the extra expense and something didn’t quite click with me, too many bells and whistles perhaps. It does have trial and lite versions so it’s easy to see if it’s a good fit for you. 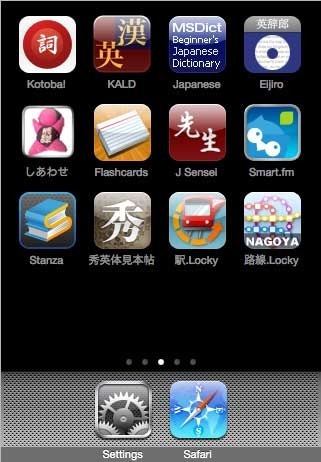 There are many I suppose dedicated Japanese flashcard programs but I find it very hard to sort of anything of quality. I’d prefer to come up with my own lists. What wanted was straight forward import and export. An SRS system preferably a bit more sophisticated than a basic Leitner card system. Text styling. Pictures and Audio support would be a bonus, I don’t use them at the moment but you never know. I went with Flashcards Deluxe in the end. It’s fairly simple but still full featured. It has support for three sides per card and two categories and a flag. You can colour cards and style the text. This is all achieved with html tags so it is easy to set up your list in a text editor. Import is via a WiFi link to a server. (Apple won’t let anyone sync over a USB cable). The author provides a webpage and use of a server for you to upload your cards. If you want you can also share your list with other users. He also gives details how to set up your own server. Export is by email or back to the server. From the app itself you can access Quizlet.com if you don’t want to make lists yourself or duplicate effort in making lists from popular texts. Although due to sheer volume I wonder about how useful quizlet is and what quality the lists are. You can also make and edit lists within the iPhone app. It’s completely standalone really. It’s drawbacks. Well it could be I’m not used to the iPhone OS yet but in Flashcards Deluxe the settings and interface seem a little bit sparse and disorganised. Replacing the ? button for a cogwell icon would be a start, and reserve the ? for when you are giving extra information about the app or interface would be a start. That said after a little exploration I’ve found out most things. It could also do with a Desktop client. However I have an idea about this for my Kanji FileMaker projects; after all it’s only a webpage away. This is the other flashcard app I have installed. I liked Smart.fm when it was still iKnow. Now I don’t use it so much after the redesigns. Mostly it’s just too laborious to make your own lists and almost impossible to export them. (Although you can export via Anki and making a list from a textfile is in progress) The iPhone app is nice but has limited offline functionality, and is only a subset of what is possible on the smart.fm site. There is another app (unaffiliated with Smart.fm) iKnow Touch (£1.20) that uses API’s that smart.fm publish to download entire lists that looks a bit more interesting, as it doesn’t rely on a constant connection. I only found it while checking links for this post. –update on iKnow Touch– I’d save your money. iKnow Touch downloads your lists, (and the audio card by card), but that’s all. You can read them but not test yourself on them. I don’t need to sync with my progress on iKnow but it’d be nice to have flashcard functionality, or export, or copy and paste, so I can use them in another program. It’s also the first app that’s crashed on me. I can’t recommend this. For most uses I prefer electronic dictionaries over print versions. Lighter and easier to search. As long as the battery holds out and you don’t drop them. Can’t beat free as a price. Kotoba! uses JMDict data as do most of the Japanese dictionaries and applications you see in iTunes and on the web, especially the free ones. So mostly all that differentiates these apps is the interface or price. Kotoba! does everything I want for now, why pay more for JMDict or Edict data. I may succumb to the uninspiringly named Japanese later on, it looks to have better cross references and a cleaner interface, but the £10 price is offputting. Across the store 60p and I’ll buy without much thought; £5 I’ll probably buy if it fills a need and looks like quality; £10 and I really stop and think; over £15 and it needs to be extra special. The immediacy of the App Store is dangerous, all those costs add up. ( £6, $10, 1200円, €8 ) This is a good implementation of the print version the Oxford Beginner’s Japanese Dictionary, including its essays. Edict is fine for what it is, but it gives no guidance or differentiation. What it lacks is professional editing and compilation. I’m willing to pay for that and £6 is very good value for an electronic version of this dictionary. I already own the print version and thoroughly recommend it as a first E-J dictionary. It’s limited in its entries but should have most of what you may need as a beginner but more importantly it gives good examples and usage guidance. As a J-E dictionary it has the problem that you need to know the reading to use the index. You could use the Chinese handwriting fingerpainting recognition, but it is sometimes hit and miss. It would be nice to have multi-radical search for kanji. There are also hotlinks in the entries to allow you to explore cross references and it has a history function. There is another version of this dictionary in the store that is the same price, has a nicer icon, but I think has put in English audio instead of the articles from the print dictionary. I’m unsure. I can speak English so the audio is not really any use to me and misses the point of a dictionary primarily designed for English speakers. I usually call this KKLD but for some reason officially it’s KALD. No idea what A stands for. It is one of my favourite print dictionaries and I was delighted to find it in the App Store, it was released in late April. This has the best interface of any of the electronic dictionaries I have on the iPod. It’s a very well made implementation of the print version. It includes all the essays and appendices as well. It looks wonderful. All the kanji are hotlinked making it very simple to explore the compounds. It still has SKIP, which was a good invention for paper dictionaries, but to be honest only Jack Halpern’s dictionaries use it. Now that it’s electronic there’s no good reason not to have multi-radical as well. There isn’t a radical index which is a pity, nor are the numeric indices searchable which is a pity as I can’t quickly cross reference with Edict as I can with the paper version. There is an English index which is a huge bonus. A nice feature is you have a choice between romaji and kana for the readings, which was always a criticism of this dictionary especially by the “romaji is evil” camp. The quality of editing in this dictionary beats any other kanji reference currently available on the iPhone platform. It is expensive though in the App Store ecosystem, but compared to the print version it’s a bargain. This seems to have disappeared from the UK, Japanese and US app stores. I’ve no idea why. I hope it hasn’t been withdrawn permanently it’s an excellent dictionary and I’d like to see it supported. (I’m showing an update I can’t access in iTunes) I only hope iOS4 doesn’t break it now. I asked the publishers, enfour, about the disappearance. All they can say is that it is an “internal matter”. I can only speculate that it’s a rights issue. I hope they can sort things out. Not so good. No copy. No hotlinks. The barest of interfaces. A fairly useless flashcard system. It’s a pity as I like the Eijiro dataset. I thought this looked like the best of the dictionaries on the App store that use it as the others looked overly gaudy and unprofessional. For now I’ll just stick to Eijiro on my MacBook where I can cross reference it and copy and paste. Maybe this app might improve and in the meantime I don’t want to throw good money after bad to explore the other eijiro apps on the store. And now this has gone from the App store, and stops working under iOS4. Good riddance. Many of these seem a bit cheesy or are at too basic a level. By and large I’ve ignored them. This caught my attention though. On the face of it it’s a custom flashcard app, that introduces words ten at a time, in no discernible order other than relative difficulties over a couple of hundred lessons. So far so blah. What earned my money was the audio and example sentences. Every sentence and word has a native speaking it. Every word had an example sentence. It is all searchable like a dictionary. That alone would have convinced me. As a bonus there are some nice review games. A multi choice quiz, where the audio is also used. A matching pairs memory card game. Sentence building from the word elements. Select the correct particles game and a draw lines to match pairs game. These provide necessary variety to my flashcard studies. The interface is ok although the reviews criticise it, I think the programmers are looking for a designer to spruce it up a bit. I’ve come across some audio doesn’t quite match what’s written though which is a bigger problem. It’s rare though. Sometimes it’s a different particle. Other times the complete sentence is different from what’s printed. Both are always correct though, it’s not bad data, just oversights in matching up the thousands of sound samples. The other niggle is any word you look up is added to your flashcards, I’m not sure I want this, at the very least I’d like to be able to edit what has been added. I bought the full version as I wanted to use its potential as a dictionary. It does have a free lite version, where you can buy the extra levels from within the app. This is a very clever graphical representation of timetables for the Nagoya underground. I go to Nagoya and I’m not sure how useful this information is because the trains are so frequent but I keep this just because of it’s uniqueness. Crowd sourced train and station information for Japan. Most of it is offline but you can download and store it on your phone. Obviously all in Japanese and quite hard to go through at times, but with a bit of planning it might be useful on a trip around Japan. This is a reproduction of an old specimen book. Doesn’t do much but the typefaces are beautiful especially the kana which tends to be much more expressive than the kanji typeforms. An ebook reader. It seems full featured although I’d prefer to scroll rather than “turn” pages. Reading is doable but not ideal, although I used to read on my Palm and the iPod has a much better screen. Check out the free versions of Lafcadio Hearne‘s first hand accounts about Meiji period Japan as in-app downloads from Project Gutenberg. You might also search out “hana” in Feedbooks if you’d like to attempt to read something in Japanese; also available for download in-app. There are also translations of famous Japanese authors such as Natsume Soseki’s Bothcan.